I was hoping to have all 11 of the rest of these done this week. Not yet, though. There are some interesting combinations here. Some of these are not my favorites (blue stripe!) but I think they will all look fine in the finished quilt. 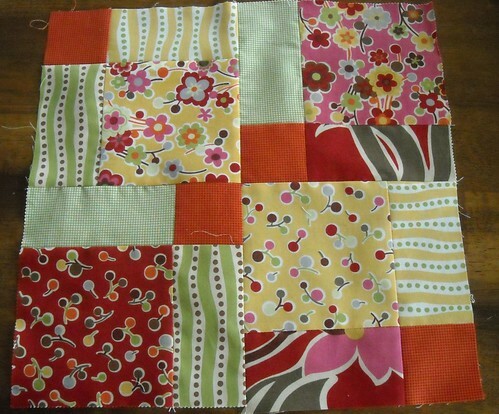 I used three fabrics in a couple of the blocks... 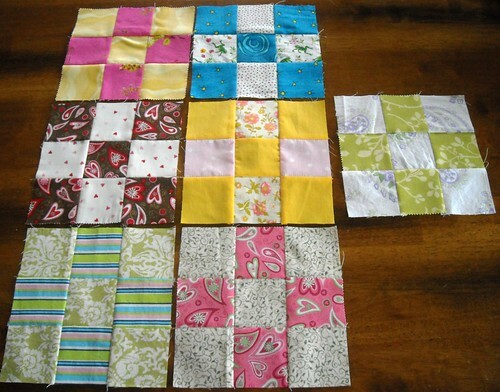 I really wanted to use the rose print in the block with solid yellow, and same with the rainbow dot fabric (with the froggies), but didn't have enough of those two for four 2.5" squares. I do have to say that the green viney print with the pink hearts is from my first ever quilt shop fabric purchase (circa 1997) and is still one of my favorite prints. I finished two more 9-patches as leaders-enders while I was sewing my last bee block today, and I have the fabric picked out for the last two. 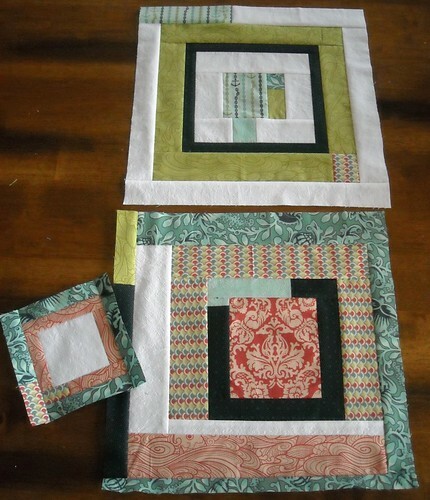 Here's my June block for Leslie of Block Swap 2. My first ever disappearing 9-patch. Hmm... I was thinking about doll quilts for my nieces today... this would make a quick and easy design for them. And I finally finished up my Drunk Love blocks for Julie. These, for me at least, take some time and thinking. I really like the finished results though. I can't decide which one I like more. I really like the coral fabrics, but the green and navy blue look so good together too. I still need to sign my name on the siggie block. The solids in these blocks are Kona crush fabric, I'd never seen it before. It has a crinkly, cushiony texture and I really like it. 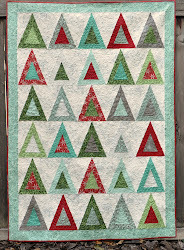 I might get some for the sashing in my 9-patch quilt. I couldn't make the back without piecing it. I used the more solid-ish fabrics for the pieced strip and I like how it turned out. Especially the orange part. 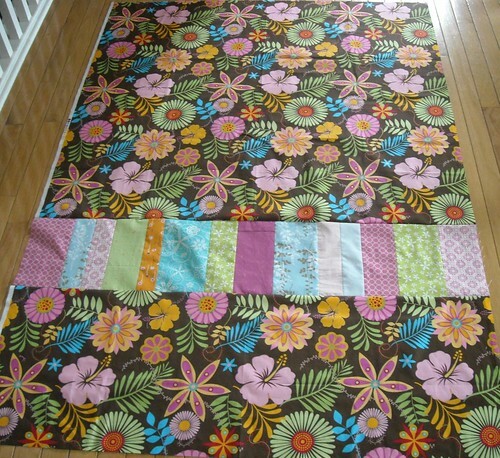 This quilt is pin-basted now and ready to quilt, as soon as I can get to the quilt shop for thread. I'm linking up at Sew & Tell Friday again; go see what everyone's been making this week! I like every single one of your blocks! And that backing--swoon! You got a lot done this week. I really like the Drunk Love blocks! You're right about the orange. The colors you picked are wonderful! Don't you love it when you can be so productive in one week?! Love all that you have done! Once your done with your 9 patch quilt, you won't even notice the stripes any more. Enjoy your weekend! Love the green and navy Drunk Love block! Wow! The back for your circle quilt is really nice. I like the pieced section in it! I like pieced backs when they are simple like that. Your Drunk Love blocks are really nice. My favorite is the one at the top. I love the little accent pieces in the sashings. And that disappearing nine-patch is really pretty! I'm inspired to get back to one I started and then got stumped on. Also, I have really enjoyed watching your nine-patch blocks appear. I'm definitely going to have to do a scrappy nine-patch! Thanks so much for sharing. I always enjoy your blog so much! Beautiful blocks, and I really love the green and white Drunken Love block! Those colors just really speak to me! You are making some great things. I love pieced backs. They're so "outside-the-box"! Your drunk love blocks are really cute. I've never seen those before. The blue/green is my favorite.